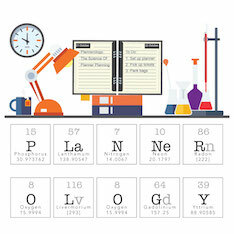 The DiY planner website has been around for ages. 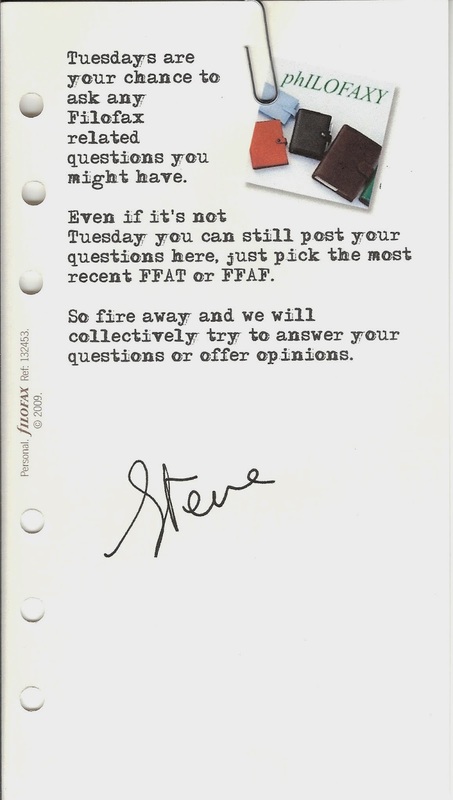 It is where I first started to share my Filofax Templates, before I knew about Philofaxy even! They have had their Dynamic Templates for years too, these are generated by an application which will run on a Windows PC or a Mac. I noticed recently they had come out with an Beta for an updated Mac version of the software, I've downloaded this and it works on the latest version of the Mac OS X operating system. The date of the first week, so you can try these out for different weeks as you wish. Layout and there are many to choose from including daily, weekly, monthly, yearly. 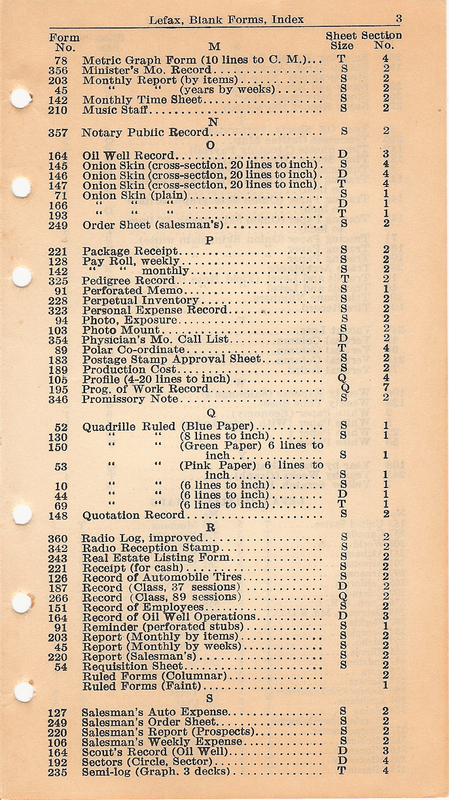 Paper Type - European (ISO) or US sizes or Custom. In the Line Spacing and Thickness tab you can set the line spacing on entries to a selection of different styles and adjust the line thickness used in the templates. As you change any of the parameters though the results are shown on the screen as you can see above, so you don't have to print it out each time you make an adjustment. The scale adjustment in the top left hand corner allows you to tailor it to fit your own screen. To output the final result you can save the template as a pdf file, then you just print your pdf file in the normal way. However take care that your pdf doesn't get rescaled, always print it at 100% other wise your margins will be different. These pages are great for trying out ideas, or may be just to try a different page size format before you commit to using it full time. When? - Sunday 4 May from 9am London time, 10am Paris time, 6pm Sydney time and 8pm Wellington time. Additionally I will be on line at 8am Anchorage, 9am San Francisco 11am Chicago, 12noon New York, 5pm London time, 6pm Paris time etc. See the World Clock to make sure you have the right time. Hope to be chatting with you on Sunday 4 May 2014. My first Filofax ‘proper’ was a personal Hampshire in brown leather, bought in 1999. My Husband actually spotted it in ‘Macro’ (a trade warehouse for non-UK readers) and I snapped it up together with an A5 Kent, in black, for him. It stayed on my desk in work where I used it every day, it travelled with me as I moved from job to job and I only stopped using it in November 2013, when I scaled up to an A5 Filo. 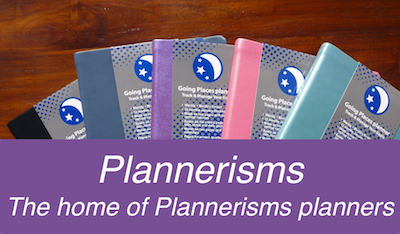 My very first planner was a pocket-sized Regent Microfile in tan leather, which I received as a gift in 1986 and so started my all too frequent trips to the stationers to stock up on inserts! I used it daily and it was only usurped when I bought the Hampshire. At this point thirteen years have passed and I am only two planners in! Since then I have added a couple more to my collection, being content to remain (mostly) with the Filofax brand. I feel quite the opposite about inserts though and will happily use any brand that fits. At the moment I enjoy using Paperchase to-do lists and notepaper, the quality is good and I like the splash of colour on the outside edges. Having discovered the beautiful Gillio’s and Van der Spek range via Philofaxy, I am very tempted to jump ship. I am still very much attached to the Hampshire, which I adore for its’ rich colour and pocket layout plus the size makes it big enough to hold lots of things but still be very portable. But the A5 is working well for me and has become my new favourite for work. There are plenty of pockets for all the bits and bobs I collect throughout the working week and the size makes it easier to write in. I have quite large handwriting and the personal size can be quite prohibitive in this respect. I have six: a pocket Microfile, a personal Domino, personal Identity, personal Hampshire, A5 Finsbury and finally an out-of-character purchase for me - a Paperchase ‘Budgerigaga’, which is pink and covered with budgies. 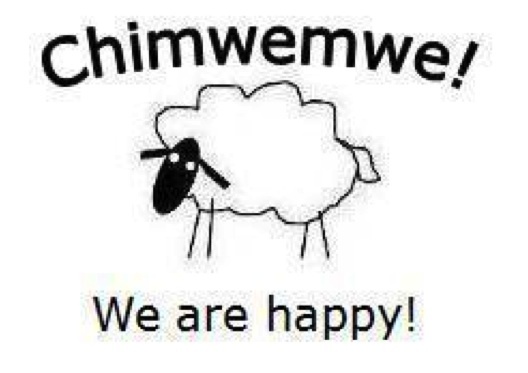 HOWEVER ... 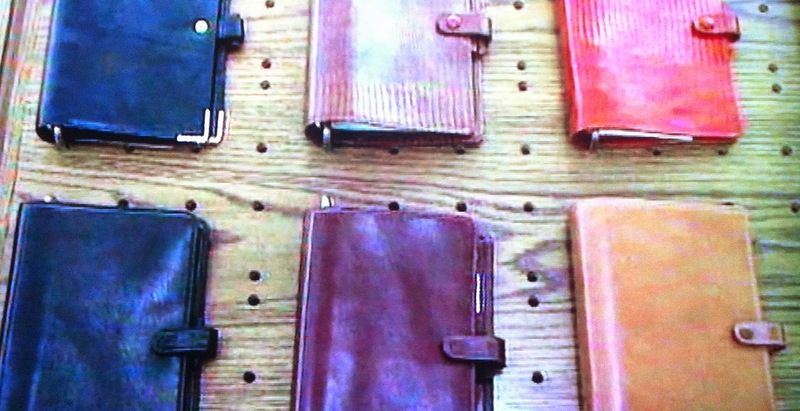 I am awaiting the arrival of my 7th planner, a personal Microfile which was an impulse Ebay purchase. Oh dear! 5. 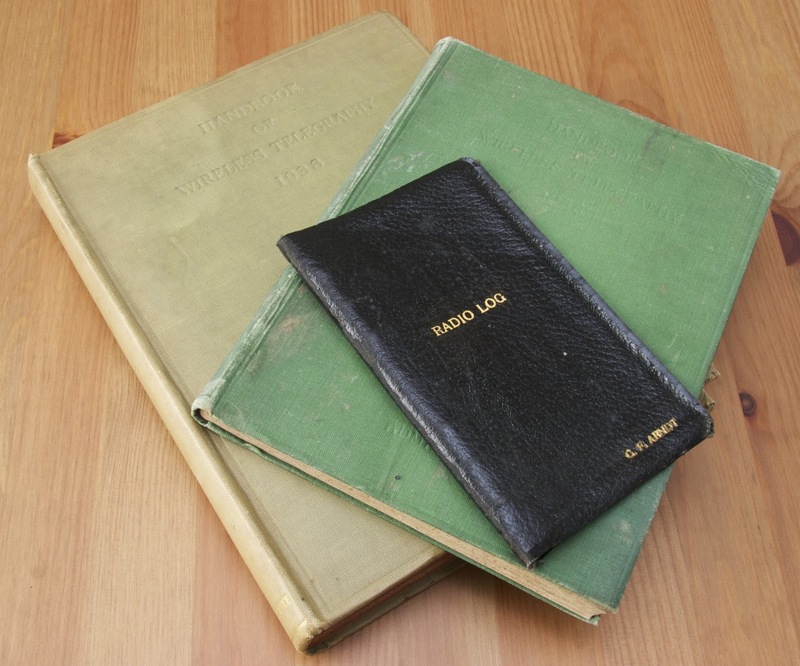 What is the oldest Filofax in your collection? The Hampshire is the oldest Filofax in all senses of the question. 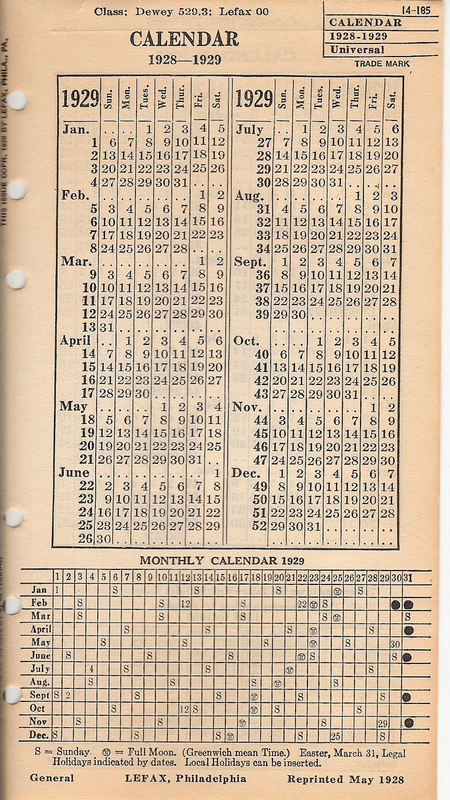 While I do like some of the newer planners I really do love the vintage ones, although they weren’t considered to be so, at the time of purchase. 6. What do you use your Filofax for? The pocket Microfile is my ‘go everywhere’ planner. It’s small and light enough to throw in my bag and I use it to jot down things that occur to me that I want to follow up later. 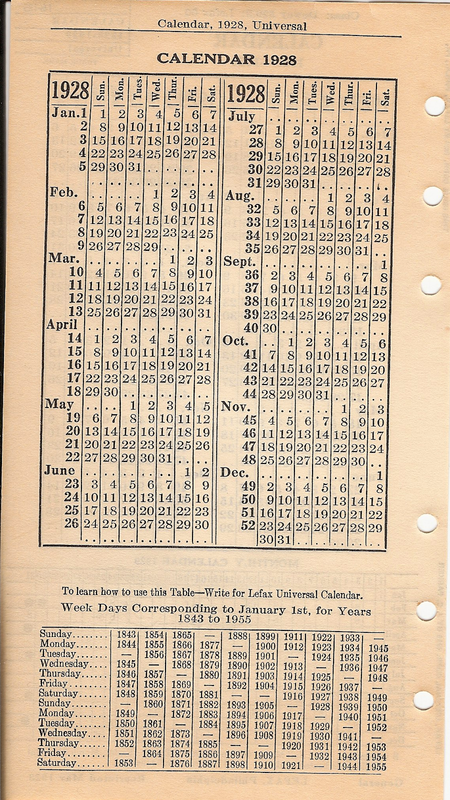 It is also useful to have a small diary on hand to record future appointments. My personal Domino, in violet, is my holiday planner. I like to research the places we visit and collect information on local attractions, markets, good places to eat and I have separate sections for local maps and travel details. It comes with me on holiday and, owing to the elastic band, I can throw in the many leaflets I collect while out and about and I know I won’t lose any, or have them littering the bottom of my bag. I have to say that I really disliked the colour of the elastic band, until I read on Philofaxy how someone had coloured theirs with a Sharpie. So I did that and it looks a LOT better in black. My personal Identity, in black, is my household planner which contains my cleaning schedules and reminders for jobs round the house. If this sounds like a ‘Fly Lady control journal’ to you, you’re almost right! Her whole system wasn’t a perfect fit for me, so I adapted it to suit. My A5 Finsbury, in black, is my work planner and it doesn’t move from my desk. I use it daily and while I am very flexible on inserts, I absolutely couldn’t do without the ‘week to view with notes’ diary layout – it’s the only one that really works for me. My personal Hampshire is a ‘satellite’ to the Finsbury. 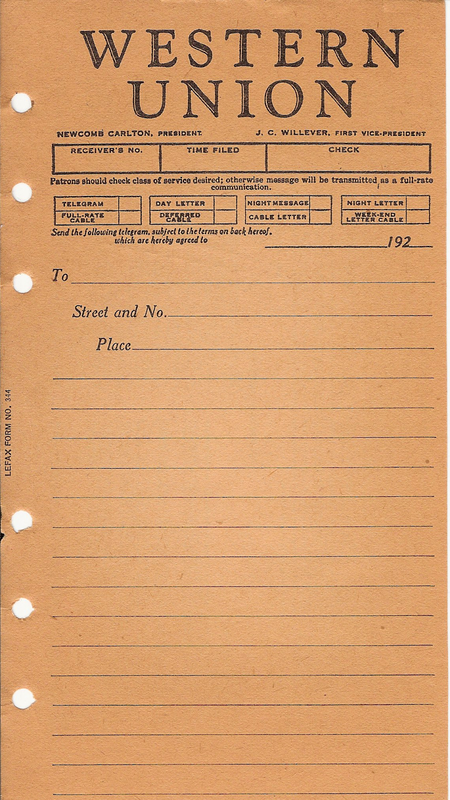 I use it at meetings and conferences and transfer the useful information and scheduled appointments to the Finsbury when I get back to my desk. The Paperchase Budgerigaga is my garden planner that holds scheduled tasks, planting notes etc. I have absolutely no idea what I am going to use the personal Micro for! Suggestions please? Flexibility and portability. I have always disliked bound diaries as you are limited by what someone else thinks you need to have. My first actions when I buy any planner, is to throw away the information on European clothes sizing and weights and measures etc. I simply don’t need them! So I like that my Filo is totally customised to my needs. The A5 aside, they are small enough to fit in most bags and unlike electronic devices, are not reliant on battery life and/or wifi connections for me to be able to make notes and schedule appointments on the hoof. I would like to combine the stylings from the Domino with good quality leather. Dark brown on the outside, light tan on the inside with a wide striped elastic band, 30mm gold rings and an elastic pen loop. I sometimes use ‘fat’ pens owing to my arthritic hands and the fixed loops don’t accommodate them well. The Micro is carried in whatever bag I happen to be using and I’m not precious about it at all. I’ve done this since 1986 and apart from a small tear in one of the card slots (my own carelessness in trying to wedge two cards in one slot), and some wear and tear on the pen loop, it is in excellent condition. The Identity and the Budgerigaga live on my kitchen dresser and the Domino stays on the bedroom bookshelf between holidays, but it gets carted around in my tote bag when I’m on my travels. Both the Finsbury and Hampshire remain in work, the Finsbury on my desk and I just carry the Hampshire. I have finally stopped getting strange looks when I arrive at meetings with my old-school Filo. I guess they are used to me by now! I considered a Malden for a very long time, visiting the display at Lewis’ on several occasions to examine them. I love its layout and the detail on the closure, however I finally realised that I prefer a stiffer cover. I also discounted the Baroque for the same reason – far too squashy for me! I do like the Osterley range however and I think I will push the boat out and treat myself on my next birthday (a ‘significant number’ celebration!). 11. 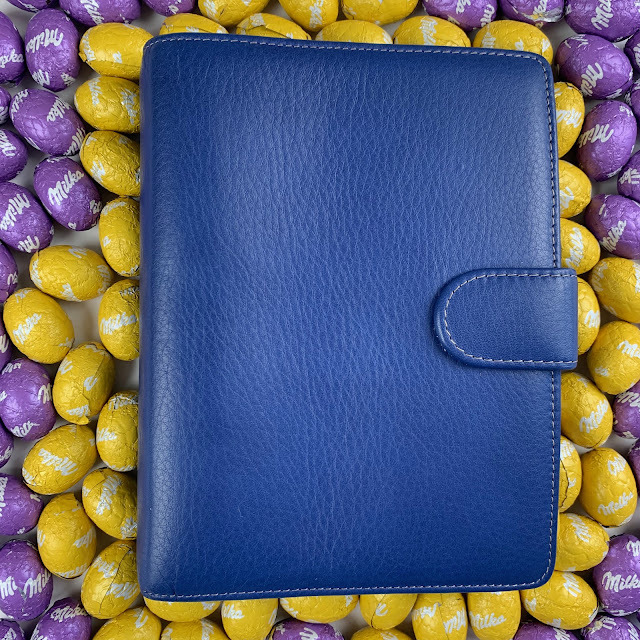 What is the most you have ever spent on a Filofax? Which model? I have been very lucky so far, or thrifty depending on how you look at it, because one was a gift, one was from a trade warehouse and so considerably cheaper than retail, three were bought in mid-year sales and two were Ebay bargains. The A5 Finsbury turns out to be my most expensive purchase at just £20. I don’t know if this counts as a ‘hack’ but since I relocated my diary pages to the back of my Filo I have found it far easier to enter information on them as the rings don’t get in the way when writing on the left hand side. I also have the clear flimsy plastic flyleaf over the weekly diary page and use it for temporary post-it note reminders. There is always something interesting to read about Filo use or history. I like to understand how other people use their planners although the ones adorned with washi tape, stickers and all the colours of the rainbow are totally alien to me. The ‘web finds’ posts are brilliant for discovering interesting blogs and I have found several that I go back to on a regular basis. I wasn’t over fond of the old background colour, but that has been changed now so it’s all good. My last single download was ‘I Just Can’t Rely on You’ by Paloma Faith. My last album download was ‘Disco Defenders’ by Alcazar. I am an unashamed lover of the disco genre and I discovered this Swedish group as a result of random clicking on You Tube. It makes tedious gym sessions go with more of a swing. 16. Mark Darcy or Daniel Cleaver? 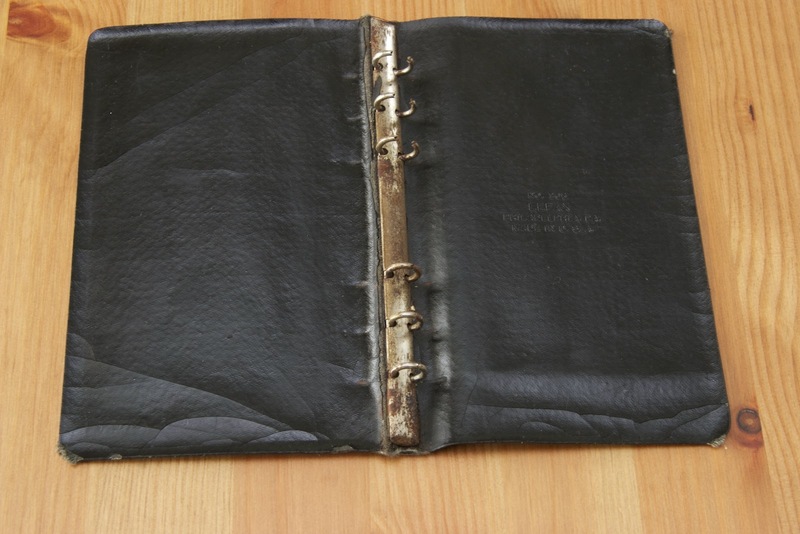 Mark Darcy – he bought Bridget a new leather journal; he obviously ‘gets it’! Thank you Jacqueline for your contribution. Spring has sprung here in the Northern Hemisphere, and it's spring cleaning time! 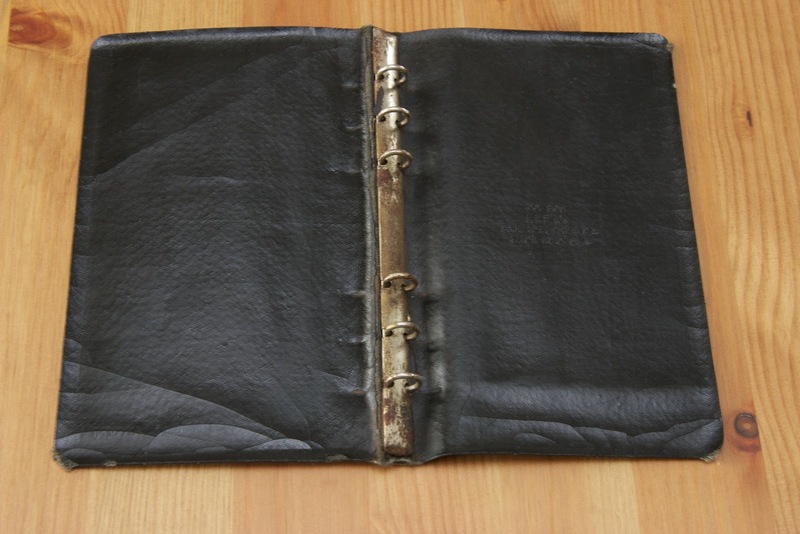 It might be time to rotate out your old pages, freshen up your tabbed sections or give your leather binder some treatment. With big summer plans on the way, now is a good time to get your planning system ready! Friends in the Southern Hemisphere have winter on the way with busy times for work and school. Now may be a good time to jettison old pages and prepare. Do you do a seasonal clear-out or spring cleaning for your binder? 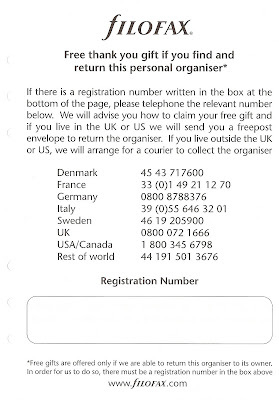 If like me you swap from one organiser to another during the year. Instead of just taking all the pages out and moving them across in to the other organiser. Take 5-10 minutes to see if there are any pages you can remove, discard or archive. It is very easy for your organiser to grow through the year. I try to remember to do this every couple of months, it helps if you have a variety of different ring sizes in your organisers. Until the next tip happy organising. Check out other tips here. 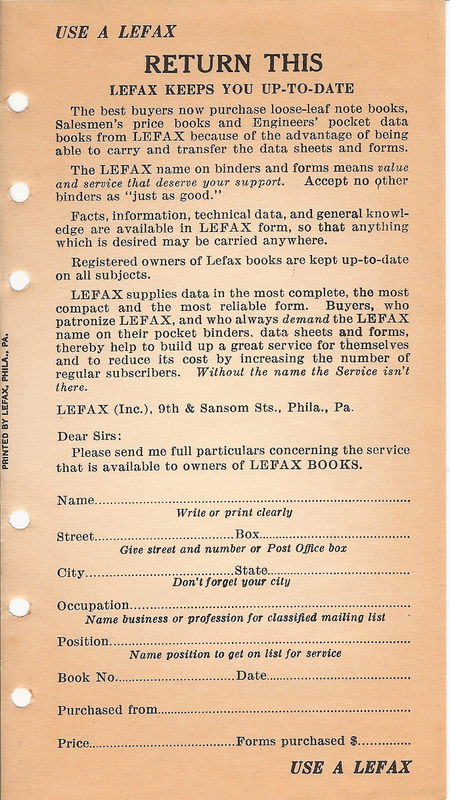 You might recall Paul did a guest post on the Lefax Radio Log back in August 2012, well recently he offered to donate it to me for safe keeping and also because of my radio engineering background, which was very generous and kind of Paul. We agreed the best way to get it to me and it arrived when Alison was at the London Book Fair a couple of weeks ago. It arrived safely, but seeing it close up the leather organiser is rather delicate. But Paul had managed to remove the pages from the rings successfully without doing any further damage to the organiser. I've been doing some research and I'm making contact with The Leather Conservation Centre in England, so hopefully I will have some better answers on how to preserve this leather artefact for many years to come! The ring mechanism is a little bit rusty, but they still work. I will be hoping to attend to the rust soon as well. I have also scanned in all of the pages at a reasonably high resolution and I will be making these scans available for research purposes as well. So although I read Paul's description a couple of years ago there was one small detail I sort of over looked. 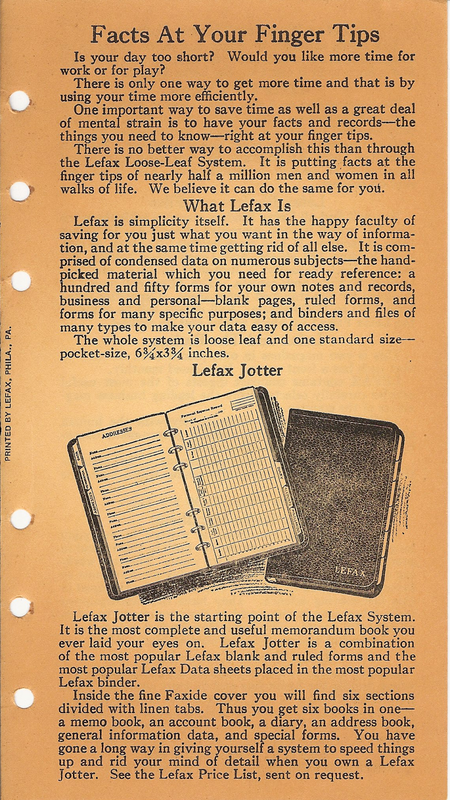 This 1920's Lefax organiser has a very different set of rings in it compared to the type we see these days. Because there are no tabs you have to use the rings themselves to open them. 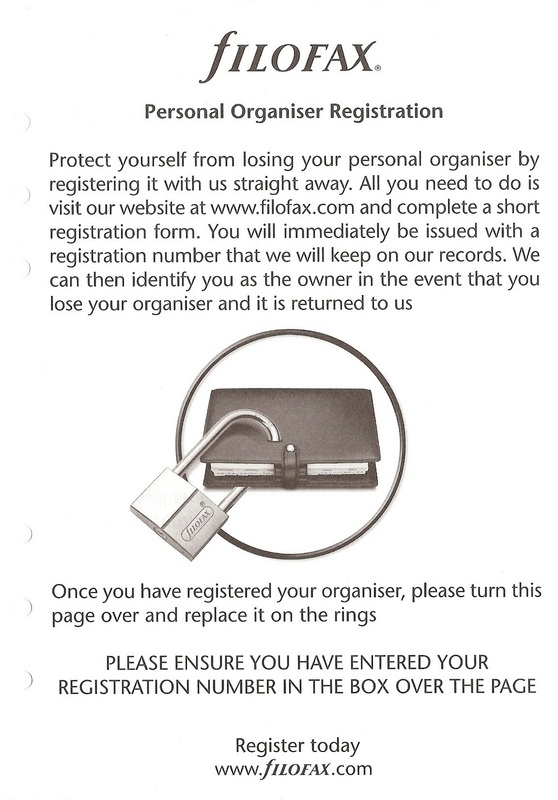 And as you know we strongly advise against doing this with any ring bound organiser these days. Simply because pulling apart one set of rings can twist the internals of the mechanism and you end up with the well known gaps in the rings issue. However, if the rings are independent of each other, like on this one the problem is greatly reduced. I am not sure when the ring mechanism makers around the world stopped making rings like this, but there are definitely some positives about this type of design! Having scanned in the pages I was able to read the pages much easier on my big iMac screen as my eyesight isn't so good with small print and trying to read things close up, old age sadly. But on the screen I am able to read the pages with ease. Some of the following images you will have seen as photos in Paul's original post. A huge range of inserts, some I can only guess what they are about. 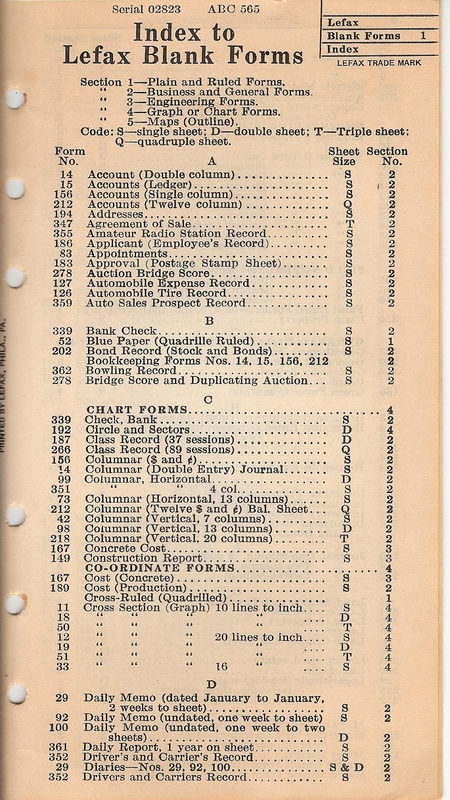 This is just the first page of the radio log, I'm sure you don't want to see all 32 pages of it. But in case you do, hop over to my blog and you can see it in full. 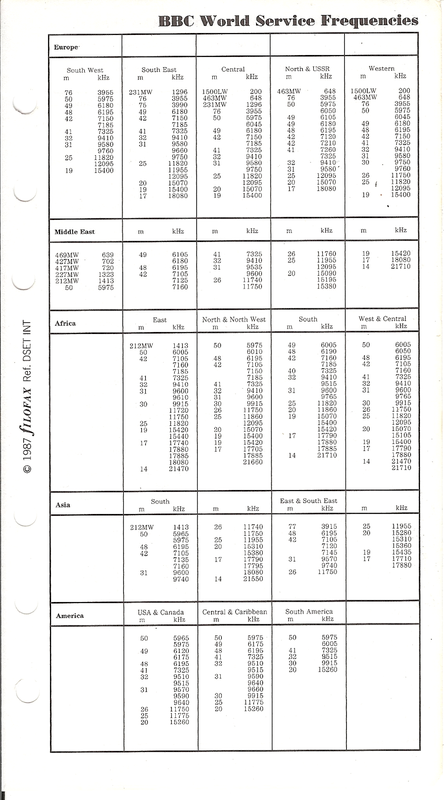 As a comparison, come forward 60 years to the late 1980's and these are the sheets from the Filofax International Data Set that included the BBC World Service frequencies and broken down in to regions served. 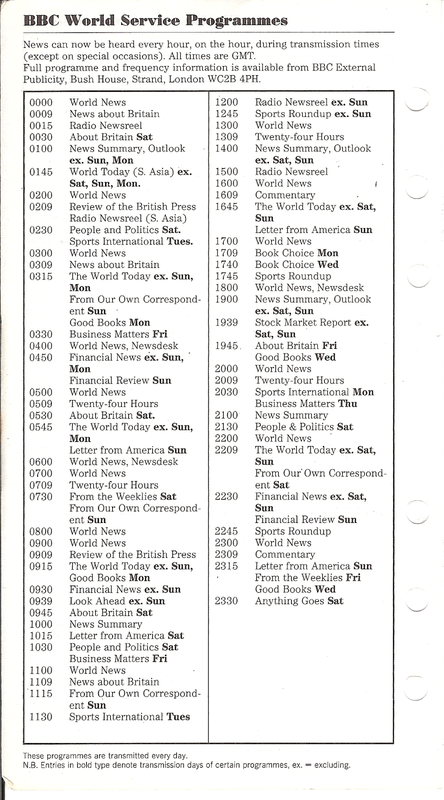 And the list of programmes for the BBC World Service from 1987. 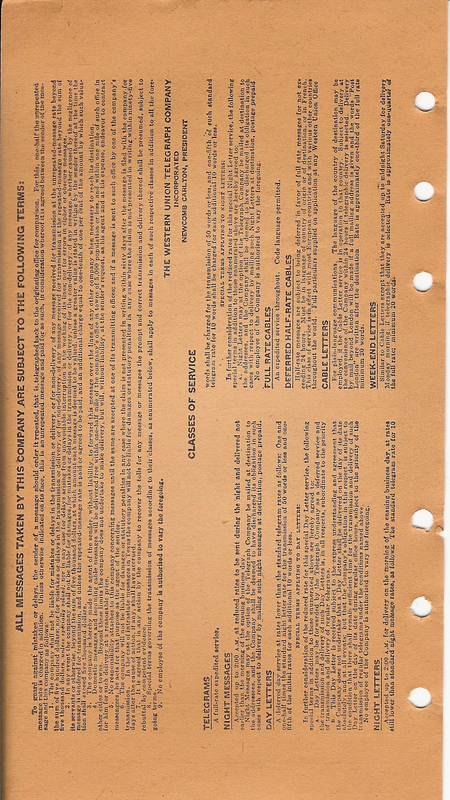 Admiralty Handbook of Wireless Telegraphy 1938 edition which cost £0, 6s, 9d in 1940.. I have the receipt! 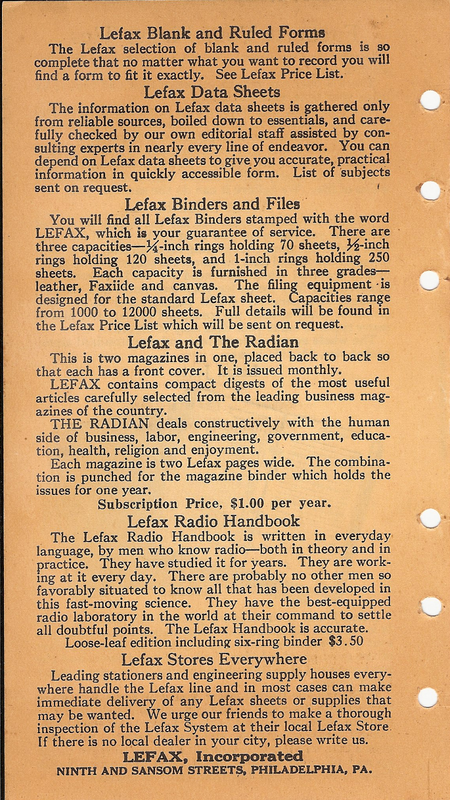 an old Morse key, and the pages from the Lefax Radio Log! I like to keep up to date with technology! When I got my first Filofax back in 1986 I was working for the UK radio regulator in the section that assigned frequencies for sound broadcasting transmitters in UK. I mainly dealt with the ones on VHF FM, but my colleague that I sat next to dealt with the MF (Medium Frequency - 526.5 kHz to 1606.5 kHz) assignments. 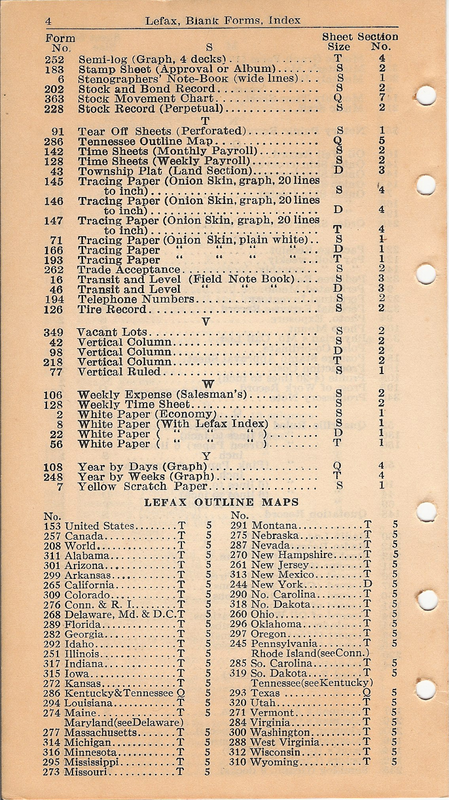 So it was interesting to see the equivalent lists for the USA back in the 1920's. Back in the 1980's BBC and IBA (Independent Broadcasting Authority as was) used to produce their own Engineering Information Guides. 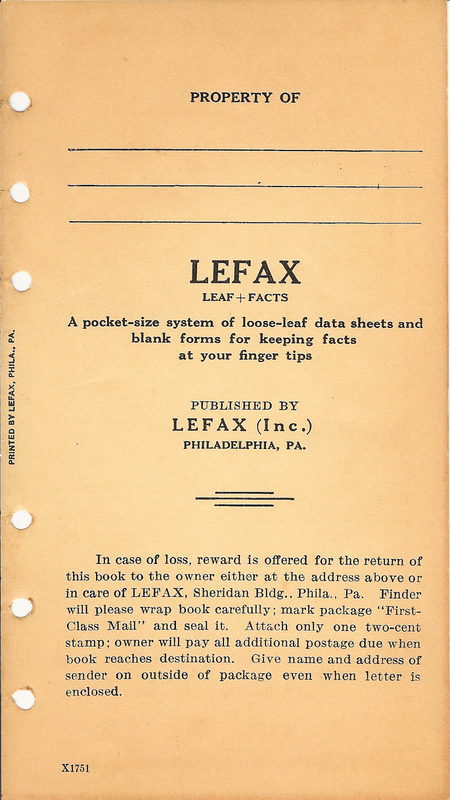 These were small pocket books that listed all the radio and TV transmitters, the size of the books where about Filofax personal size, which for me at the time was very convenient. I will enjoy doing more research in to how spectrum management was carried out in the 1920's compared today. I've already spotted something in the details that might be worth exploring in more detail, but I will tell you about that at another time! 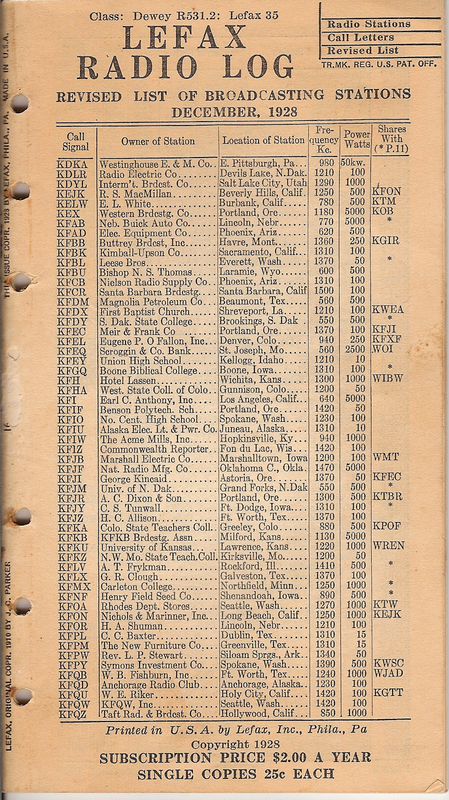 Again thank you for Paul's generous offer to donate this radio log to me. 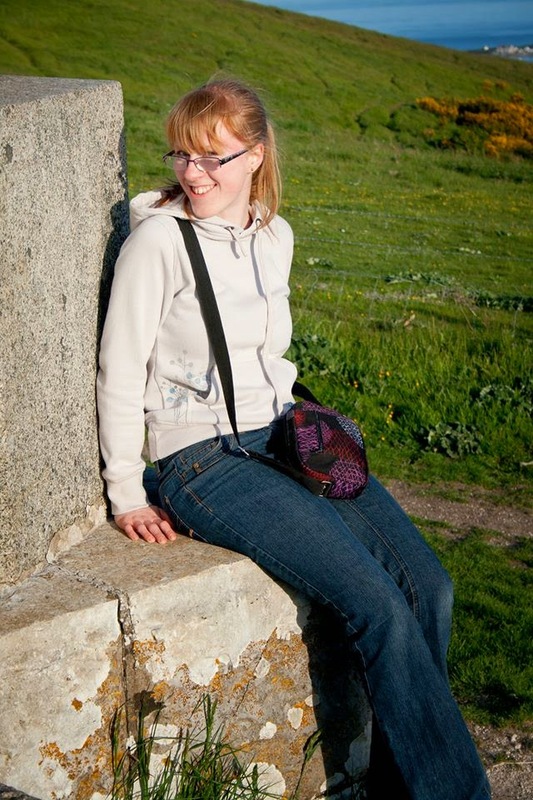 I was looking back through the archives the other evening trying to decide what to write about today... but I spotted that it is just a few days more than 4 years since Laurie and I met for the first time in 2010 in London. We discussed a lot of things that day, even with my poor memory I can still recall how we didn't stop talking about organisers whilst we walked along the London South Bank in the sunshine. One thing we both agreed on 'If you like it... buy it' and it still holds true today. More so now I guess, although the number of people that visit Philofaxy every day has increased since 2010, there are still people that we are attracting from our audience on Facebook and elsewhere. So there's even more people hunting around for those models from the past. Time and time again I see messages on Philofaxy, in my inbox, on Facebook. They normally start with 'I'm looking for an x in y size and in z colour' and you don't even to look most of them up, because you know they were phased out a couple of years ago or more! Sometimes we get lucky. I often suggest placing an advert on Ad-spot, that can often turn things up that people have hunted for on Ebay, Amazon, every possible FF site in the world and one can turn up on Adspot. I still haven't gotten round to selling my A5 Mulberry or Amazona, so maybe I felt it would make more sense to use what I already had, rather than having something else new? I have moved the Malden's contents back into the Mulberry and will definitely find a new home for the Amazona. On consideration, maybe I haven't been feeling the A5 Malden love as much as I thought because I'm so content with my personal size one? I'm going to hang onto my Mulberry for the time being for when I want more space and for planning projects, but I think I'll set a time to review how it's going. Have you finally got your hands on a binder you'd assume you would adore, but just didn't bond with it? Hi everyone! 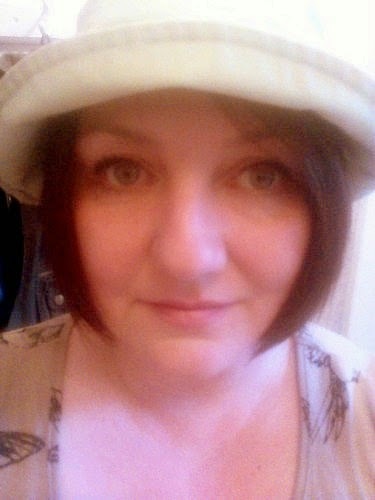 My name is Ann-Marie and I blog at addicted to stationery. I'm a 23-year-old Nursery Nurse who is looking at training to be a Primary School Teacher in the future! I spend most of my time at work, but I also enjoy running and baking. My first organiser was a Paperchase own-brand organiser, which I bought at some time in September 2012. It was Pocket-sized, which was fine for me at the time - but once I upgraded to Personal I've never been able to downsize again! I've only really looked at either Paperchase's own binders, or real Filofax ones. Other ones are a bit out of my price range. I was once gifted a Ferrari organiser, which doesn't have any branding on it but is red - as you'd expect! My beautiful, beloved Personal Springboard is by far my favourite. I o3. Out of the organisers you own which is your current favourite (Style and Size)? wn 8 in total - that's including Flexes. 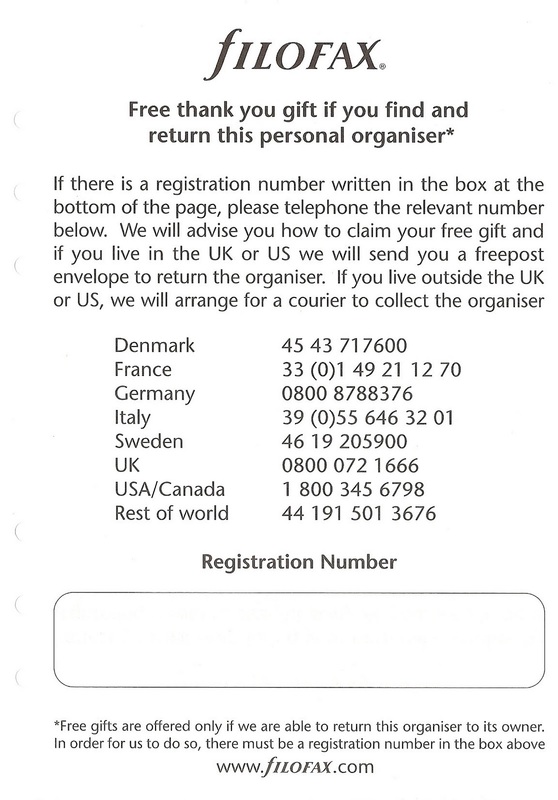 4 Filofax organisers, and 4 other organisers. My Pocket Paperchase organiser, which I've had since 2012. I carry my Personal Springboard and A5 Flex with me all the time, as I am mid-way through the process of seeing which one works better for me! 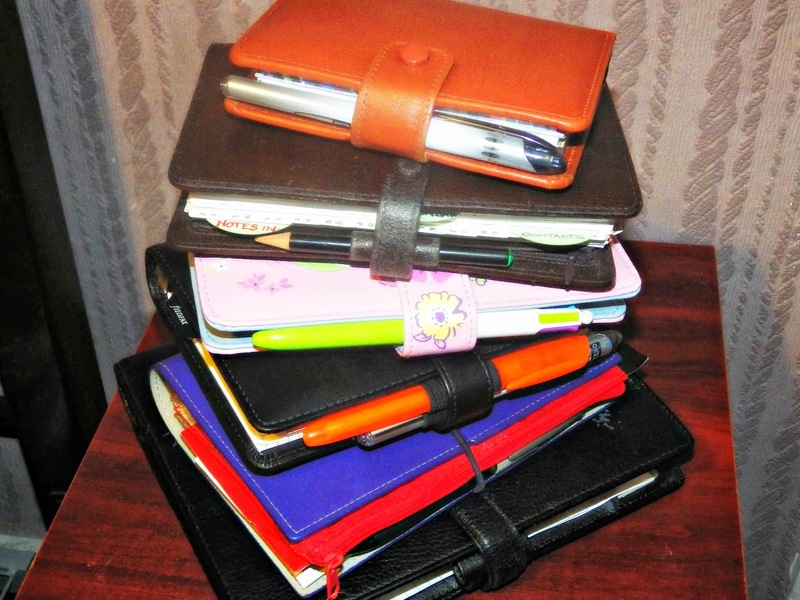 I use them as a diary and for taking notes on the go. I have a Pocket Metropol which I use as a financial tracker for noting down all my spends. I'm using one of my Paperchase binders as an address book, and my other binders are used as storage binders - I seem to have accumulated an awful lot of spare inserts! It has to be the fact you can just add or take away any paper from it to make it what you want to be, which just isn't possible in a bound planner. Even though the Flex doesn't have rings, you can add or take books and notepads from it to completely change its purpose! I carry my main Filofax in my bag, without a protective cover. The Springboard cover seems to be able to handle whatever abuse I throw at it! My A5 Flex also currently resides in my bag. My other Filofaxes stay at home. I like the look of the new Floral Burst Cover Story, and I'm hankering after a purple Songbird, both in Personal size. I think my partner would go mad if I bought any more Filofaxes though! I'm a bit of a cheapskate. The most I've spent is £28 on my Springboard, which was originally £35 but then had a 20% discount applied! I don't really know of many hacks, to be honest... the only one that springs to mind is chopping down and punching an A5 Flex pen holder to use as an extra pen holder in a Filofax. I thought I was really clever for coming up with it, but then I went online and found loads of other people had already had the same idea! I love the fact that there's such a huge international community here, with such different people who all have various planners, in various sizes, with various uses - and yet everyone bonds over their love of planning and organisation! Nothing! As cheesy as that sounds, I can't really think of any negative aspects of Philofaxy. I just bought the Teenage Dirtbags compilation CD, and it's pretty awesome! 16. George Clooney or Brad Pitt? Neither really - I'm not a fan! I can't actually think of any celebrity crush at the moment. Thank you Ann-Marie for going under our spotlight. 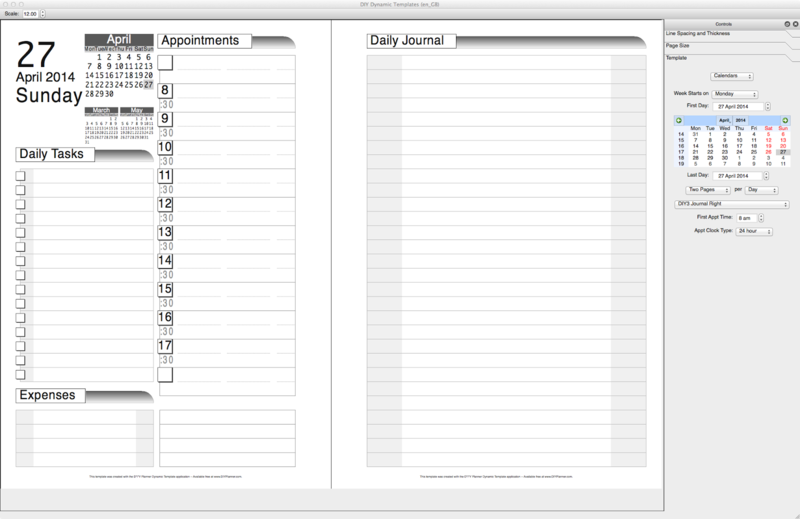 Filofax: Personal Aqua Malden - What? that pink Filo! How do I start using my Filofax? - What? that pink Filo! The limited edition Gillio medium Compagna "Bellezza" organisers have been shipped. Only 25 of these organisers have been made or 26 if you include the original one that was given to Mella as big thank you gift from the company back in November at the Gillio meet up in Brussels. 'Welcome on board Flight Bellezza 25 to all points of the globe. Our aircraft is under the command of Captain Ben Van Haelen. He has informed me that our flying time will be approximately 4-5 days. While we are here to ensure that you do have a comfortable trip with us today, we are also concerned about your safety. With that in mind, we ask that you take the Safety Information Card out of the seat pocket in front of you and follow along as we perform our safety demonstration. So 25 people will be looking at their tracking numbers on their phones at every waking hour watching for the progress of these very special organisers. The Gillio group on Facebook is ready and prepared for 25 unboxing videos... and an album for the first pictures has been set up ready for the avalanche of photographs. 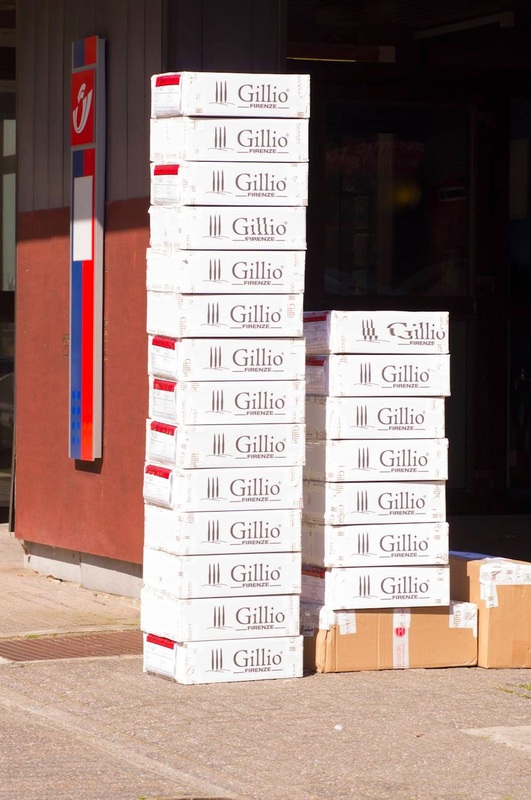 Thank you to Ben and the team at Gillio for keeping us on tender hooks waiting for these to be despatched, I know the buyers are all keen to receive them. My brother-in-law recently got married, so I've had some time catching up with my husband's family which was very nice. With some of the relatives that don't know me quite so well, the conversation inevitably came round to, "So, where do you work?" I am employed and self-employed, and some time ago I started buying and selling Filofaxes as part of my business. It was quite interesting hearing people's opinions and overall they were very positive, with only one mention of it being considered geeky. I don't think that any of them will be rushing out to buy a binder any time soon, but I'm glad that I brought it up as it is something different to talk about. Do you think that you would've talked about Filofaxes in a similar situation? And as always on Fridays, please feel free to ask or discuss anything ring-bound organiser related. Should weeks start on a Sunday or a Monday? For various reasons I didn't have a very good week last week. So this week I was determined to put last week behind me and start this week with a clean sheet... or in my case a new week per view set of pages in my A5 Filofax organiser. So in the right frame of mind I sat down this morning to plan what I needed to do and on which particular days they needed to be done one etc. It got me thinking... always a worrying sign... Why do some people prefer diary inserts or calendars that start on Monday and other people prefer ones that start on Sunday? It was sometime in late 1986 I think that I bought my first Filofax. I was thinking this morning how much things have changed in 28 or so years. Back in 1986 I used to commute in to London on the 8:03 from Tunbridge Wells every morning, smartly dressed in my pin stripe suit, carrying a brief case and a copy of The Times. 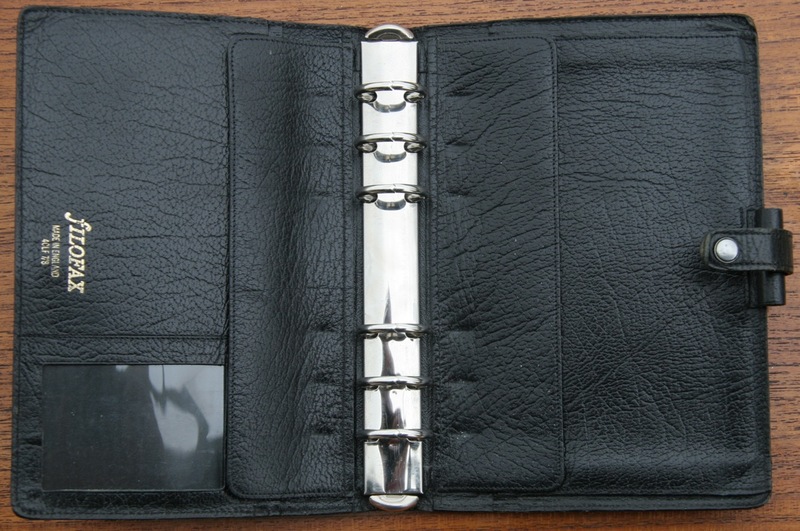 I had seen an article in The Times about Filofax organisers and how they had become a popular 'must have'. Straight away I wanted one! There was no internet back in 1986 to go on line and search around on, only local shops. I didn't find any in the local shops in Tunbridge Wells at the time. So I put the idea of this new organiser thing to the back of my mind. Every month I had to pay a visit to the Civil Aviation Authority (CAA) office in Kingsway, London. It was a short walk across Waterloo Bridge and it was always a pleasant walk if it wasn't raining! 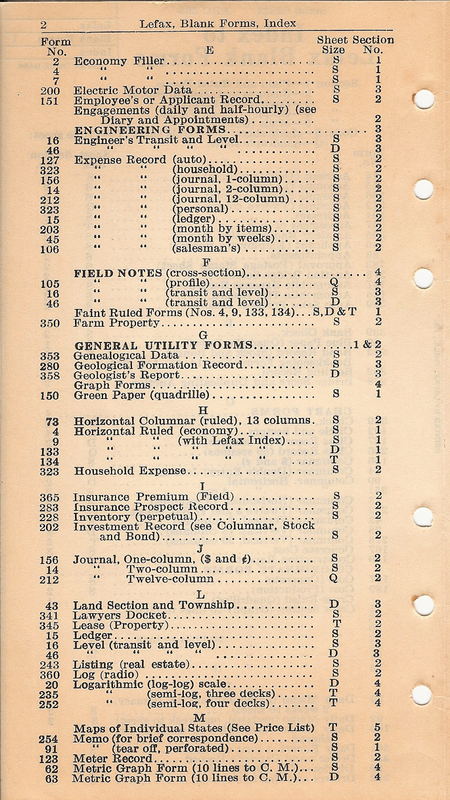 At the time there was a shop called Chisolm's Office Supplies, it wasn't a very big shop, but the front part of the shop was dominated by an island display of various Filofax organisers and inserts. I had found somewhere at last! The display had a sloping top with drawers underneath containing the stock, all made in polished wood. 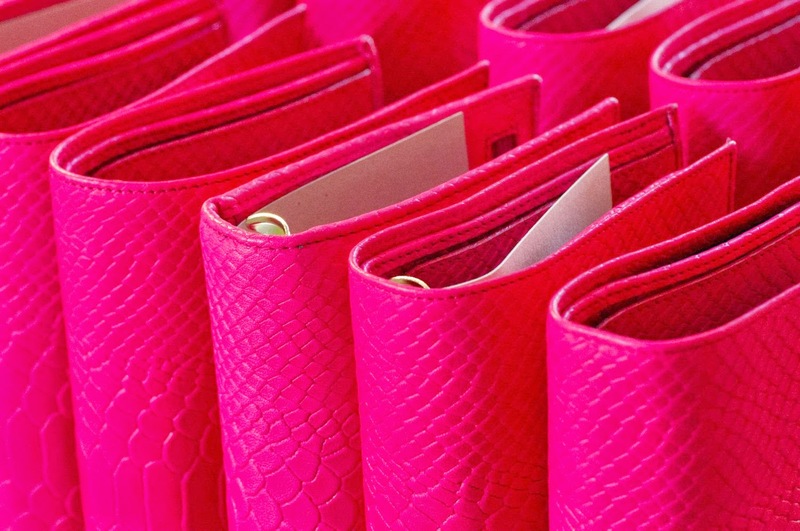 You could open each organiser and look at the different layouts and admire the different leathers. Sadly this shop is no longer in Kingsway, replaced with a building society or a coffee shop I guess. I collected a catalogue and took it home on the train to study and to try and work out which Filofax organiser to buy. The list of inserts was baffling, no pictures to show you what 'Week per view, Monday start' actually looked like. It was a bit hit and miss as I recall. I had made a list of what to look at next time I was over there. Eventually I bought my Winchester in Personal size and started adding many different types of inserts to it and started using it. Of course there was no internet or Facebook to share pictures of my latest purchase with.. in fact I don't think I would have thought to take a photograph of it, remember this was in the days of 35mm film. Come forward 25 or more years and we now have access to the internet (on our phones too if we wish). We can search from a huge range of sources for things, ask questions in specialist groups or on Philofaxy even. Everything seems to have speeded up or has it? We have all got used to placing an order on line and expecting it to arrive within a few days and the item is exactly as it was shown on the website, there's no surprises about how you visualised the layout from the description or what shade of purple did they mean! We can shop around so much easier too without wearing down countless pairs of shoes. With a few mouse clicks you can compare prices and the cost of delivery from a variety of sources. There's one problem with high speed shopping, the time it takes for goods to reach you in another country hasn't got that much faster unless you pay for air freight shipping. Filofax USA I hear you say.... is there any news? Yes there is... I had an interesting exchange of emails with our friends over in Filofax USA on your behalf. I know some of you have been getting quite frustrated at the low stock levels on the Filofax USA website, I think the staff possibly share your frustration too! The low levels of stock at present have been mainly down to the move of stock from one warehouse to a new one in Texas, they put a message up on the front page of their website a few weeks ago. The good news is that they are hoping to return to normal stock levels by the middle of June with shipments arriving at intervals over the next few weeks until they get back to the full range again. Even better news is that they will be stocking the new 2014 range of organisers and new colours in the 2014 range much earlier than in previous years. This page seems a lot more 'colourful' than it did a few weeks ago, with new items appearing each week on the site. Obviously it will take a week or two for the USA stockists to get their stock on the shelves, but I'm sure you will all be pleased to be able to buy 'locally' again rather than having to pay for shipping from UK or Europe. 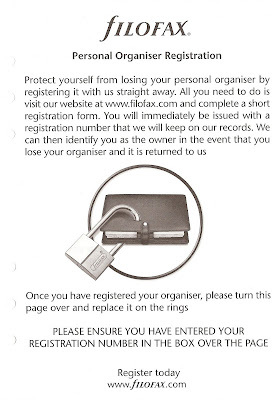 Thank you to our friends at Filofax USA for sharing this information with us here at Philofaxy. 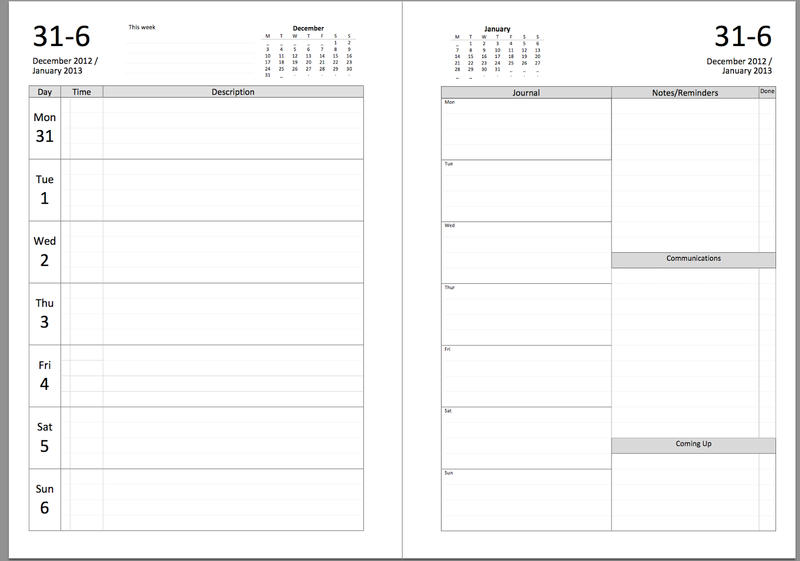 Separate Work and Personal Life Organisers?